The new Chair of Cheshire Fire Authority has insisted the safety of local communities will continue to improve – despite the organisation facing some of the most significant challenges in its history. Cllr. 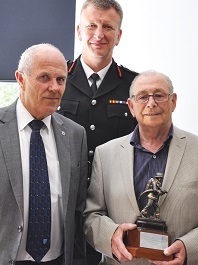 Bob Rudd, was elected as Chair on June 15th at the Authority’s Annual General Meeting and said: “I am delighted and honoured to be leading the body which manages what is recognised as one of the leading fire and rescue services in the country. The meeting heard that in 2015-16, injuries from fires reduce from 51 to 46, accidental house fires fall from 401 to 394 and fires in business and commercial premises fall from 189 to 159 – the lowest figure ever recorded. Cllr Rudd, who is also currently Chair of Cheshire West and Chester Council, was first appointed to Cheshire Fire Authority in 2011. He has been involved in local government for over 40 years, beginning his political career in West Sussex before moving to Chester in 1990 and gaining election to Chester City Council a year later. Following local government reorganisation in 2009, he was elected to Cheshire West and Chester Council and appointed Lord Mayor of Chester in 2014. At the AGM Cllr Stef Nelson from Halton Borough Council was re-elected as Deputy Chair.